Talking Spaces 9: The Decade Ahead is on 21-22 February 2019 and coincides with the ten-year anniversary of the Learning Environments Applied Research Network (LEaRN) being established. The ILETC project is one of several research projects currently underway within LEaRN. Talking Spaces 8 at Albert Park College. Over two days Talking Spaces 9 will involve presentations, workshops, discussions and site visits exploring the developments in learning environments over the past ten years and considering what is ahead in the coming decade and what further developments that may bring. 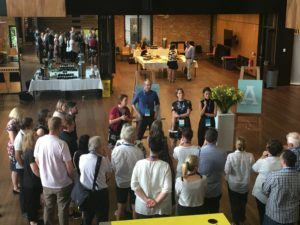 The Talking Spaces events are aimed at teachers, principals, architects, designers, education consultants, policy makers, researchers and businesses involved in developing and supplying learning environment products. Check out the highlights from last year’s event. Further information and registration for Talking Spaces 9….